It is Lancaster County, Pennsylvania, where the Lancaster Family History Conference is underway, with field trips yesterday and workshops today, then continuing through the main multi-track sessions tomorrow. The Legal Genealogist is honored to be tomorrow’s keynote speaker in the conference’s 40th anniversary year. One of more than 40 Lancaster Roots events, the Lancaster Family History Conference is under the aegis of the Lancaster Mennonite Historical Society, and that’s a major-league resource so many of us may have overlooked in our early Pennsylvania research. Because it’s not just Mennonite history that’s available there. 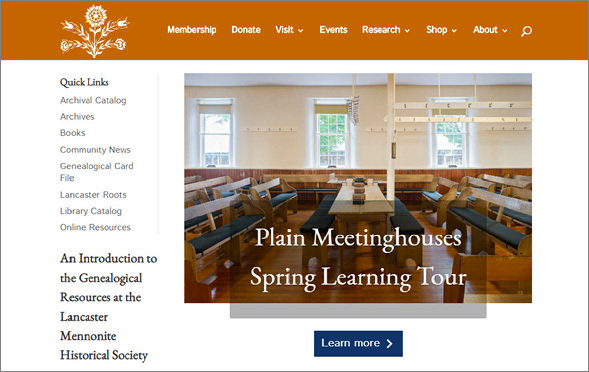 Now… yes, of course, it does serve as a major repository of Mennonite records: “The Lancaster Mennonite Historical Society serves as the official depository for records of the Atlantic Coast and Lancaster Conferences of the Mennonite Church. It also contains many records and publications of other organizations affiliated with those two conferences.”3 Anybody who’s doing Mennonite research ought to have this website bookmarked right at the top of the research list. But almost across the board, in every category of material it holds, the Lancaster Mennonite Historical Society offerings are broader — broad enough to be high on the research list for anyone looking at Lancaster County history. Those clippings are available free online. Other records and resources available free online include a number of indexes (obituaries and more), cemetery record listing, and Family Bible downloads. Other online resources are for members only — and they make the $52 annual individual membership work the price in spades. Take a look at the Lancaster Mennonite Historical Society. A terrific resource for research in Pennsylvania’s fourth county. Cite/link to this post: Judy G. Russell, “Meanwhile in Lancaster County,” The Legal Genealogist (https://www.legalgenealogist.com/blog : posted 29 Mar 2019). I just did a Location search in my family tree, and found a group of early ancestors who lived in Lancaster County! Clearly, it’s time to dig into these new-to-me resources for little bits of treasure. Thanks so much for the details!